Welcome to Driving Test Success! Since 1997 millions of new drivers have passed their test thanks to the best-selling range of learning materials from Driving Test Success. Find your freedom and the confidence to take to the road with expert resources for car learners, motorcycle riders, trainee LGV & PCV drivers and future driving instructors. From our award-winning app, online training software and comprehensive learner tracking systems, we have a training solution to suit all needs. While learning to drive can seem daunting, Driving Test Success has helped over 12 million learners pass their test - and you can be next. Whether you’re riding your first moped or scaling up to a motorbike. Find all you need to pass your motorcycle Theory Test here. Manage learner drivers for LGV and PCV with DTS Anytime and find extensive revision materials to help drivers pass Module 1a, 1b & 2. Whether you’re a trainee ADI looking for revision materials or an existing driving instructor offering your students extra help - we have you covered. We licence the latest revision tools from the DVSA - the people who set the test. Learn the way you want. With our choice of products you can learn anytime, anywhere! Recommended and endorsed by the leading driving instructor associations and UK driving instructors. Our free online Support area is available around the clock should you have any questions or queries. Practise DVSA revision questions with detailed explanations to help you learn the correct answers. 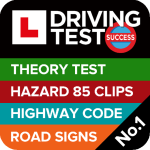 Over 700 high quality, interactive video clips set up just like the real test to help you pass first time. Study the rules of the road using the latest edition of 'The Highway Code'. Test your knowledge of road signs, signals and road markings and learn how to safely respond on the move. It’s easier than ever to practise on the move with the UK’s No.1 Theory Test app. Revise with full confidence knowing you've got everything you need to pass your Theory Test first time, with the Driving Theory Test 4 in 1 Kit from Driving Test Success. Available for iOS, Android and Kindle Fire devices for just £4.99. Passed! The questions and format on this app are exactly like that of the actual test (which I had today). I was familiar with all the test questions thanks to this app and breezed through. This app has a hazard perception practice too which is great. Worth the £5 and would recommend to anyone Thanks for the pass, developer! I passed my first time with this app! Can't praise it enough. It was very similar to the questions given in the actual test. 50/50 questions answered correctly and 65 out of 75 for hazard perception! Love it! This is worth the price. I find it hard to learn from books and take tests, but this app has made practicing for my theory a lot easier and stress free! The explanations for any wrong answers is such a good idea and really helpful! I would recommend this app to everyone! It has everything you need to pass! Used this app to revise for my theory test and ended up passing first time (49/50 Theory, 69/75 Hazard Perception) Honestly couldn't recommend it more. It has been a huge help and thoroughly prepared me for the test. Pass your test first time with the award-winning Driving Theory Test 4 in 1 app, for just £4.99!